We need to get Richard home! Myself and Richard have travelled to Magaluf, Majorca for a holiday to celebrate Richards 26th Birthday. Everything was going well, we were having the best times of our lives until it has became the worst nightmare ever! Richard has jumped into a swimming pool and broken a bone in his back neck. Richard was rushed imidietly into surgery and put in critical care without travel insurance and without European Health Insurance Card. 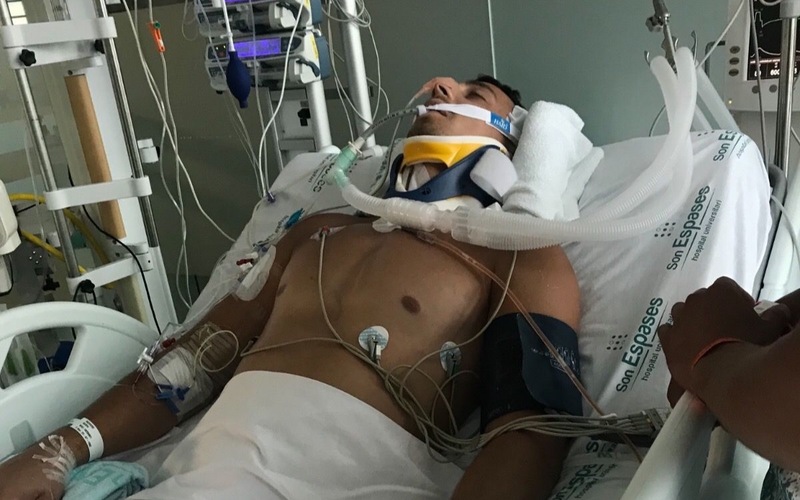 Richard is now breathing through a tube as his lungs are very weak and can not breathe on his own, He is able to move his head and his shoulders but can not move or feel from his chest down to his feet. The hospital (Son Espases, Majorca) that we are in now does not have the machines and can not give him the treatment he needs to help him. We now need to get Richard transported in a air ambulance into a hospital in UK where they will be able to help him with his breathing and the movement of his body. The whole transportation costs €20,000, doctors in Son Espases hospital in Palma, Majorca have given permission for Richard to go on the 8th of August back home to get the medical assistance that he needs however we do not have the sufficient funds to get Richard into a hospital in UK in a air ambulance. As you would assume this is not cheap but we need your help to get Richard where he needs to be to receive the medical support that he needs. Can everyone spread the word and donate what ever you can, anything will be appreciated and will help!